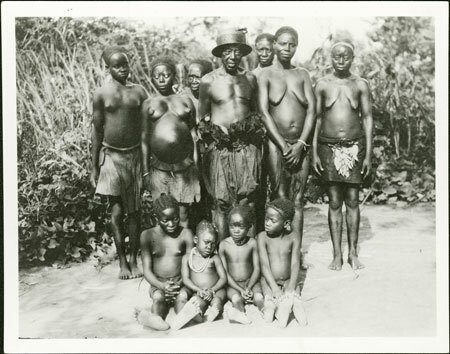 Group portrait of Ongosi, a courtier of Prince Basongoda's court (the grandfather of Prince Ngindö, who died in 1914 in a colonial prison in Wau), with some of his wives and children, one of them wearing a white bead necklet. Contemporary Publication - Reproduced as Plate VII (facing page 76) in E. E. Evans-Pritchard's Witchcraft, Oracles and Magic Among the Azande (OUP 1937), with the caption "Ongosi, a Zande courtier, with some of his wives and children"
Morton, Chris. "Zande courtier with family" Southern Sudan Project (in development). 03 Jan. 2006. Pitt Rivers Museum. <http://southernsudan.prm.ox.ac.uk/details/1998.341.270.2/>.